Hofstra Student Life: Six Years. One Season. 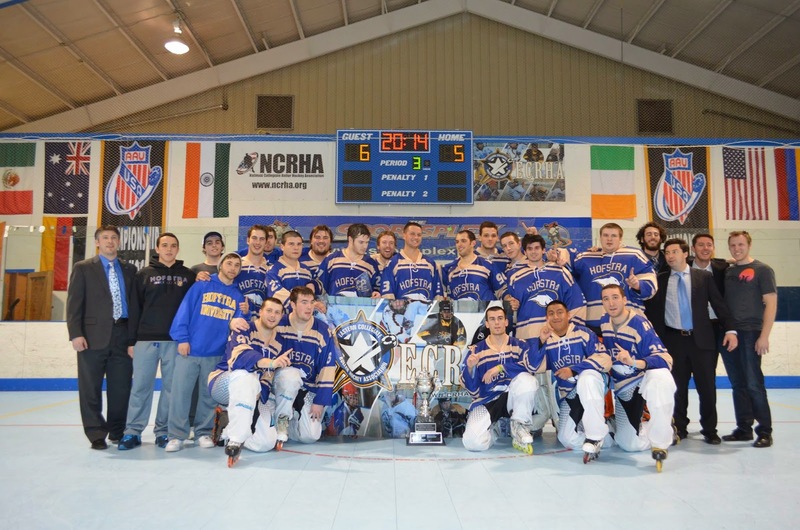 The Hofstra University Roller Hockey Club, which features a Division I team, a B Division team, along with a Recreational team, has had the same goal for the past six years – win a Division I Regional Championship. That dream came true last weekend as the club captured its first Division I title in club history. Not only did they win the title, but everything about the entire experience was magical. Teams win championships. But, this wasn’t just another championship. This wasn’t just a weekend tournament that was won by a team quickly thrown together, or even by a team that was recruited throughout the country. This wasn’t even about just one season. This was six years of dedication and sacrifice, work ethic, heart, and a desire to accomplish a common goal, all built into one long extended season. 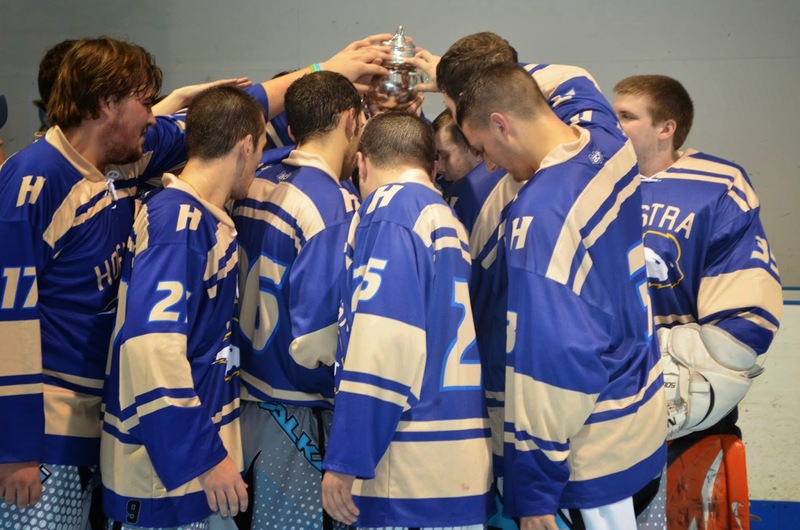 I have been the Head Coach of Hofstra Roller Hockey for the past six years, beginning after my college playing days had ended in the Spring of 2008. Having the opportunity to win an ECRHA (Eastern Collegiate Roller Hockey Association) Division I Championship title three seasons in a row as a player for Towson University, from day one of my coaching experience at Hofstra, I always had the goal to capture that same championship from behind the bench. I have pursued this goal of mine for many different reasons, but above all, to witness the faces, the body language, the tears and emotions of the players as they rush their goaltender to celebrate the dream come true. In numerous speeches in all different locker rooms, and on numerous late night drives to and from practices, I had expressed and envisioned this moment in my head, over and over, again and again. I wanted the players to experience it, to cherish it, and to have it for the rest of their lives… and I wanted to witness it all from that bench. After a difficult first year of coaching the Pride to a 2-17-1 record, the club and coaching staff was able to recruit as best they could with the resources they had. 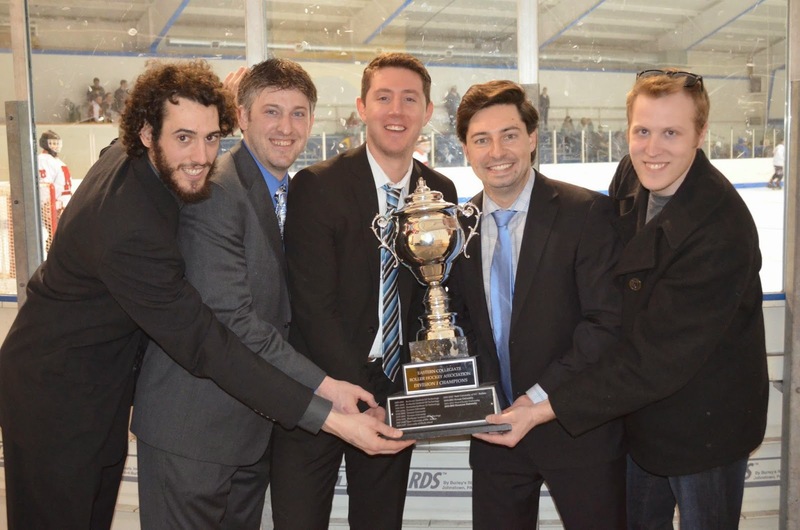 Year after year, the club made tremendous strides on the hockey rink and off. Not only was the club experiencing and learning more about the game, but the members were beginning to participate in more and more community service events away from the hockey rink, such as the St. Baldrick’s Foundation, the Special Olympics, and more. As year after year and season after season went by, major strides were made and the support from the University continued to grow. 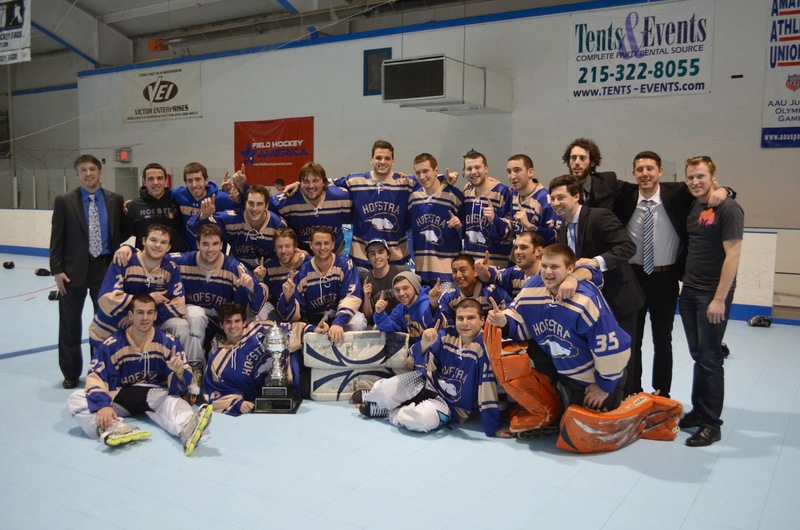 As we sought after each season, on the rink, our number one goal had always been to capture an ECRHA Division I Championship. I would stress to the players each year that it’s a process. The process isn’t about one year or one season. It’s about each season and year all built into one. It takes time to build and the one long season will reach its goal someday. Even if players would graduate by the time the goal was met, they would still be a major part of the final product. 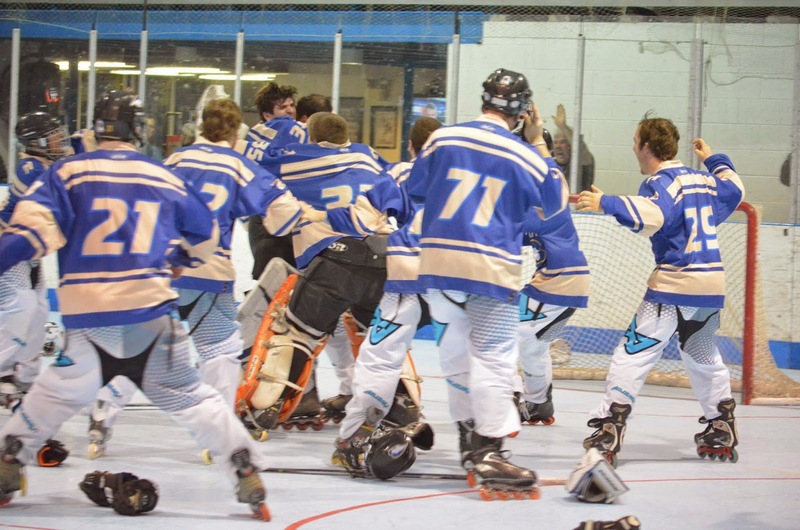 Advancing to the ECRHA Regional playoffs in 2009-2010, along with finishing in the Sweet Sixteen in the NCRHA (National Collegiate Roller Hockey Association) National Championships in San Jose, CA was a great accomplishment for the club. The 2012-2013 campaign was our best to date, finishing with an overall record of 17-2-3. 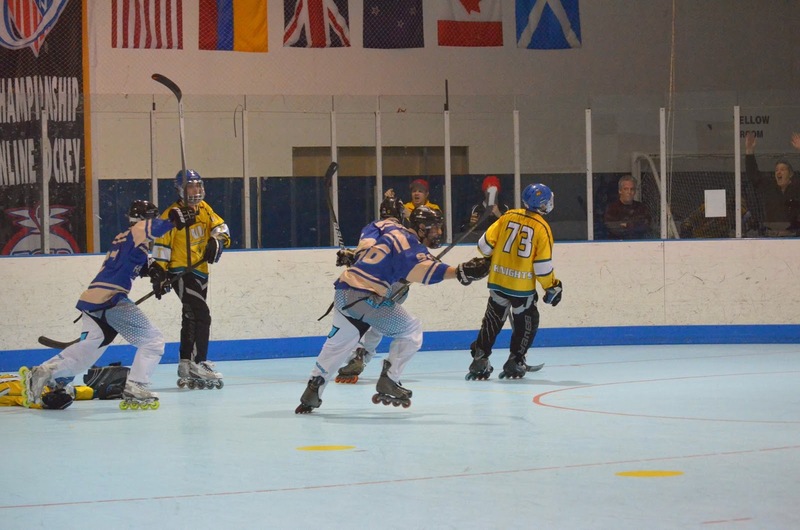 We reached the ECRHA semi-finals but had suffered a devastating 4-3 loss to rival and powerhouse, Neumann University. The team also went on to lose in the first playoff round of the NCRHA National Championships in Fort Myers, FL, following a demoralizing injury to their All-American goaltender of four years, Jared Occhicone. Despite the club’s early departure from the national tournament, at the time, and even throughout this current season, it has always been believed that the 2012-2013 team would never be replaced and would go down as our best roster and season for years to come. While the 2013-2014 season had some major roster deletions and additions, along with its ups and downs throughout, the Division I team seemed to peak at the right time. Prior to beginning regional playoffs, the team won its final four games of the regular season at home, clinching a second place seed heading into the playoff rounds and lining up on the opposite side of the playoff bracket from the undefeated and number-two nationally ranked, Neumann University. While preparing and heading into the playoff rounds, our goal was to reach the championship game and hopefully see Neumann. That was our goal – to not let another team take away the opportunity for us to play in that final game – and we would worry about Neumann when it was time to face them. With the games beginning on Friday, March 7th at Sportsplex in Feasterville, PA, the best time of the year was underway and the team’s first match was scheduled for 11am against SUNY Brockport. This contest resulted in a 9-3 victory for Hofstra. Next up was a talented group from Northeastern University at 3pm. Hofstra found a way to pull through with an intense 5-4 win. Friday evening included the ECRHA Awards Banquet and Dinner, where I was fortunate to receive the award for the 2013-2014 Coach of the Year, an award I was nominated for three straight seasons and an award that I do not take sole responsibility for and should be shared with our entire coaching staff. Following the ceremony was the club’s 10:30pm game against Temple University, which, unfortunately, ended with a 5-3 defeat and a wake-up call. Moving onto their 2pm game on Saturday, March 8, the team redeemed themselves with a 12-2 victory over Stonybrook University. Immediately following that final pool-play game was a match between Northeastern and Temple – a game we needed Northeastern to win, which would allow us to receive the number-one seed in our playoff pool, place us on the opposite side of Neumann in the bracket, and advance us to the semi-finals on Sunday (also giving us a much needed rest on Saturday evening). With all of our players, staff, family and friends in attendance, Northeastern defeated Temple 5-3 and we were off to the semis on Sunday. Since the B Team's playoff push had ended early, we dressed as many B Team players as the league rules allows us for the Division I team's 10am semi-final game against the University of Pittsburgh that resulted in a 5-3 victory for Hofstra and advanced the team to its first ever ECRHA Division I Championship game. We had reached our goal of making it to that final game. On the other rink, Neumann defeated Northeastern 7-5, a surprisingly close game. Coming into the game, Neumann had remarkably scored 182 goals in 18 games and only gave up 14 goals all season. With the finals slated for a 1:30pm start, both teams rested and prepared for the championship tilt. The crowd of family, friends and other teams in the bleachers grew larger. The players on both ends warmed up. The coaches filled out the roster sheets. The teams soon huddled up. Hofstra followed their five year pre-game ritual of huddling up in the corner of their zone. I could only imagine what they were saying as I looked on from the bench. A tear or two built up in my eyes. That subtle moment right there was another one where the chills shot throughout my body. Simply watching them huddled up and hugging one another against that corner glass, preparing to play the most important game in their lives was another moment where I was absolutely proud of this group. They had come such a long way for this. The puck finally dropped. A full bench once again. It has always amazed me how passionate and how supportive the B Team players would be on the Division I Team bench, especially when they know they are most likely not seeing a single shift throughout the game. Like we've said from the beginning, we are one team and today wouldn't be any different. “Boys, I've waited six years for this. We've waited six years for this. But, don’t do it for me. Of course, do it for yourselves. Find a way to do it out there." I will never forget the looks on their faces – so focused, so determined, so willing, so believable. Unfortunately, Neumann wasn’t going away easy. They controlled most of the play from that point and applied massive amounts of pressure. Despite Lauto’s incredible play, sure enough, with only 1:16 remaining in the final period, Neumann tallied to tie up the game, 5-5. While the tying goal took the wind out of our sails, and brought back flashbacks of the previous year, we did our best to fight through it and battle to the end, hoping to at least reach the overtime period. Approaching one minute after the game was tied, Senior defenseman, John Pachomski made a great play to deke around the opposing forward and took a few strides in before releasing a shot on goal. With the clock winding down below twenty seconds or so, there was quite a scramble in front of the net. The rebound popped out and the puck somehow found itself on the stick of Junior forward and Hofstra leading scorer, Mike Lasher. With Neumann’s goaltender sprawled out of his crease, and two Neumann defenders diving in front of him, Lasher settled the puck down, drifted to his right, and buried a wrist shot into the back of the net. It was like slow motion. We just took a 6-5 lead over Neumann University with fifteen seconds remaining in the game. The players on the rink, the players on the bench, the coaches on the bench, and the family and friends in the bleachers absolutely erupted. Standing on that bench and watching this unfold was one of the best moments I had ever been a part of in my hockey career. I remember leaning over and screaming to no end, and seeing the eleven players on our bench completely ecstatic, most with tears in their eyes. I made eye contact with Assistant Captain, Rich Schwartz, who was kneeling on the floor of the bench and praying. He lifted his head and stared back at me, both of us with tears filling our eyes. No words were said. We just stared and nodded to one another. 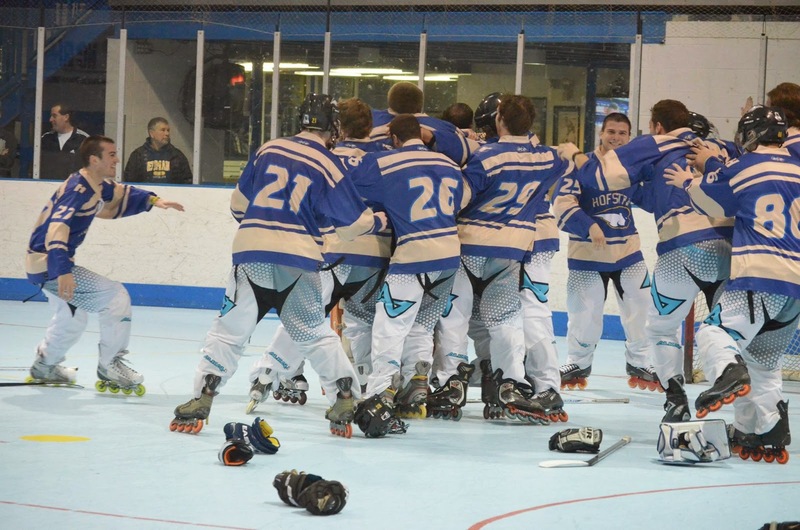 There we were, with a 6-5 lead over the number-two ranked team in the country, and only fifteen seconds away from capturing our first ever Division I title and a six-year long goal. As fast as everything was happening, I remember so many things circling my head at once - the anxiousness for that clock to finally run out, all of the laps and drills at all of the practices over the years, the disagreements, the goal celebrations, the team huddles and chants... So many things were running throughout my head at that time, but most importantly, as I was screaming, tearing, and calming myself down, we needed to settle the team down. “Settle down, settle down!”, the coaches yelled to the players. 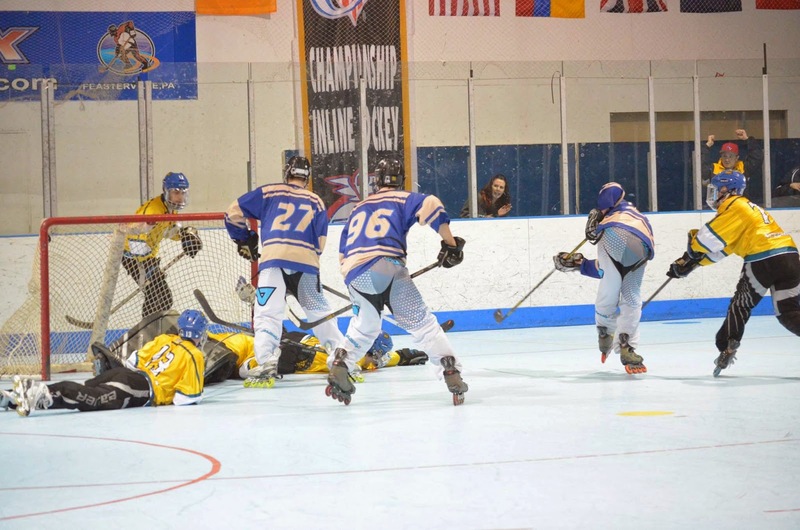 Fifteen seconds is more than plenty of time to score a goal in roller hockey. Well, on this day, it wasn’t enough time. After a Neumann penalty immediately followed the next face-off, and the time winding down in Neumann’s defensive zone after the next one, that was it. The buzzer went off. And like I said earlier, it was absolutely magical. "Congrats on winning Coach. The game was great but the celebration was even better. I remember that speech you gave us a few years ago in Connecticut and you explained how if this day would ever happen, you would just watch everyone celebrate from the bench and it looks like that's what you did..."
The hugs between players. The hugs between players and coaches. The tears. Everything continued until it was time to go through the handshakes with the Neumann organization. 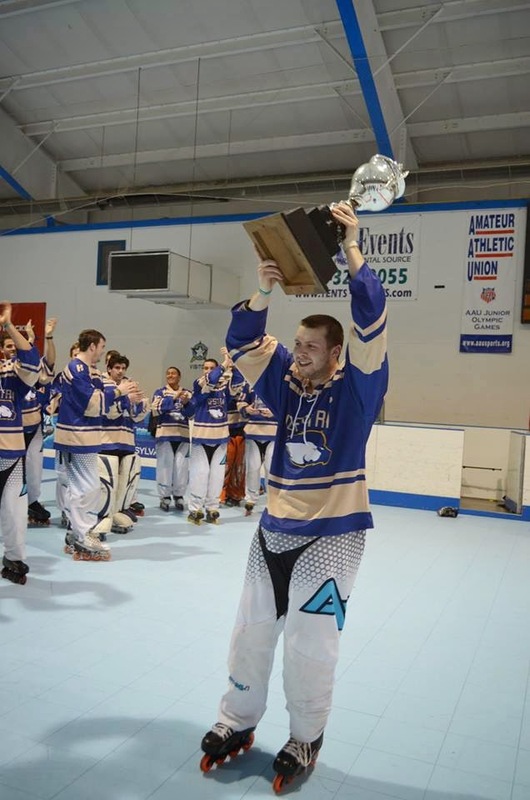 Soon after, the ECRHA staff presented Mike Lasher with the Regional Tournament MVP award. 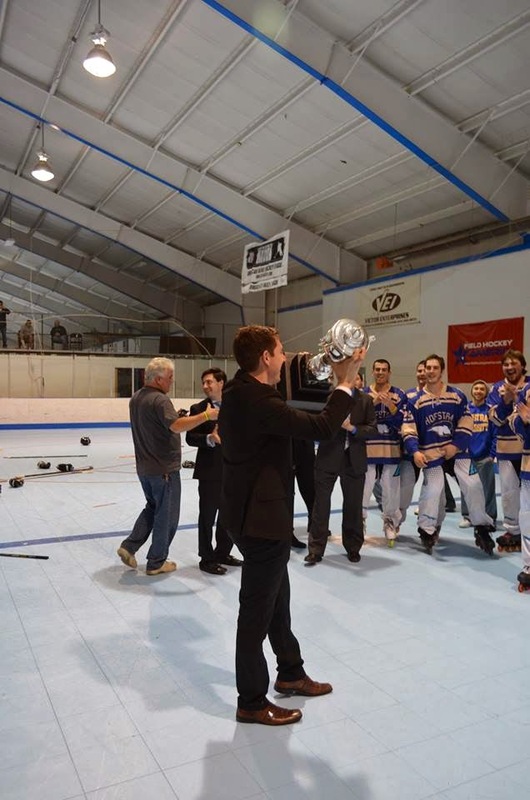 Moments later, there it was - the ECRHA Division I trophy raised to the air by all of the players. We did it. Sitting back and watching the players enjoy this moment was something I will never forget. Explaining it or writing it down as a story doesn’t do it any justice. 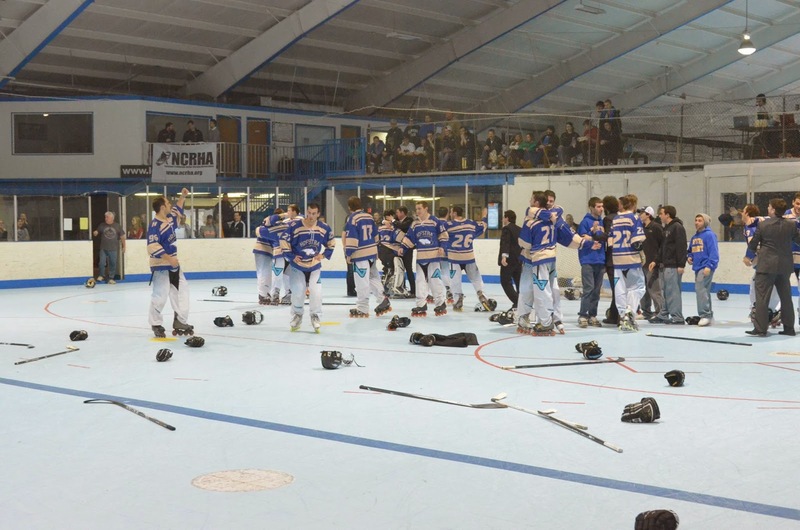 This was the most amazing day of my inline hockey career, hands down. The passion, the will, and the heart of a complete underdog. And for me, six long years as a coach with one goal in mind from day one. Every late night and early morning. Every question or doubt. All answered in one single day. For so many late night drives to and from practices, I’ve pictured this moment in my head, over and over again. And here it finally was, but so much sweeter and so much more magical in person. "Leadership, sacrifice, work ethic, heart & desire, and one game at a time."